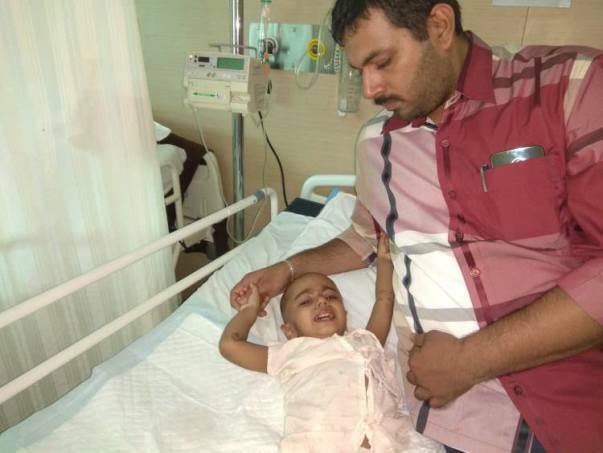 A month back 2-year-old Aniketh had loose stools and even after medication he developed constipation and stiffness in his stomach.Aniketh has been diagnosed with a fast-progressing liver cancer. His cancer has spread to the pancreas and he needs chemotherapy and surgery to get better. The doctor has advised a liver surgery and 6 cycles of chemotherapy for any chances of Aniketh's survival. Krishna and his wife Asha are not only dealing with their child's illness but are also feeling crushed by the guilt of not having found out sooner. They keep going over the different signs that were present and how they should have known that their son was sick. 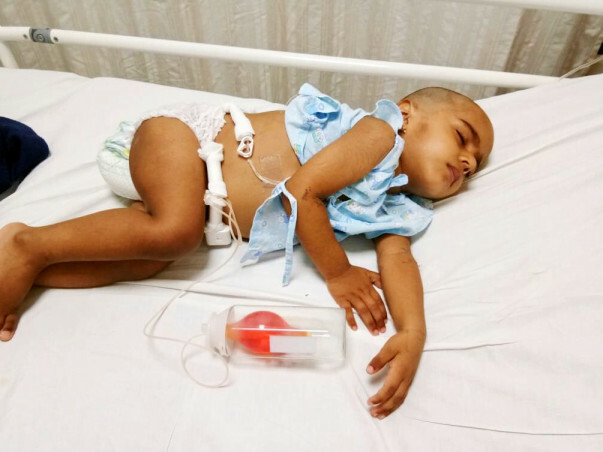 Aniketh's heartbroken parents want to do everything they can to save their little boy but unfortunately, do not have the funds to pay for the treatment. Aniketh's parents need your help to save their boy. To help raise funds for Aniketh's surgery please donate. Thank you so much for the support you have shown towards Aniketh so far. Master Aniketh KK is doing well,slowly improving and is on regularl follow-up doing with the doctors. We are hopeful for his complete recovery and will keep you posted. Aniketh is out of danger now and he has completed all his 8 cycles chemotherapy. He has responded well to the treatment. There were a series of three operations performed and all were successful. Doctors have suggested regular follow-ups for him and he will undergo a blood test every three months for the next 5 years. This couldn't have been possible without the support of you all, thank you so much for the love which you have shown towards him. Aniketh has completed 7 cycles of chemotherapy, he is responding well to the treatment. There were minute side-effects between 5th and 6th session like fever and low platelets count but as of now he is doing well. 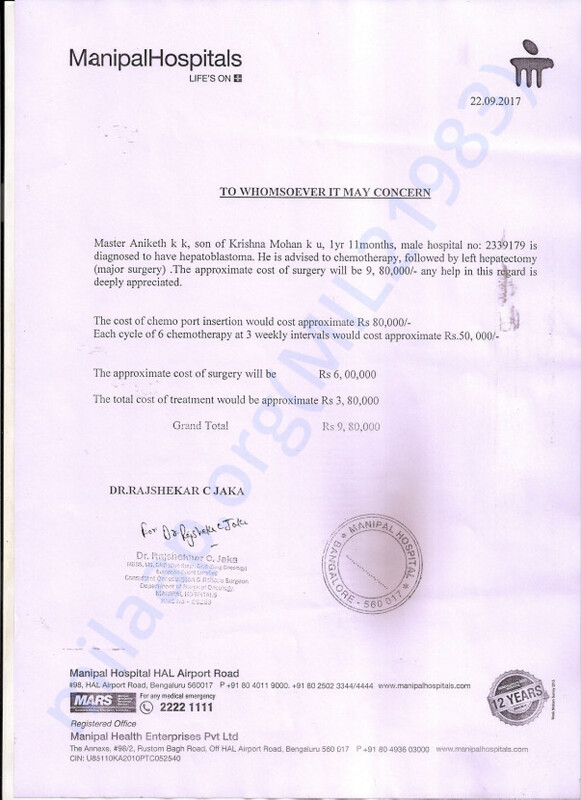 Doctors have suggested a blood test before he undergoes the 8th cycle of chemotherapy which is schedule to happen by the last week of this month. Depending on whose reports, the doctors will decide the future course of action. Aniketh is active and has a normal diet, there is a significant improvement in his health. We're all very thankful to you for your love and support which you have shown towards him. This could not have been possible without your contributions, thank you so much and please pray for his speedy recovery.